The Liberal World Order Is Dying. What Comes Next? 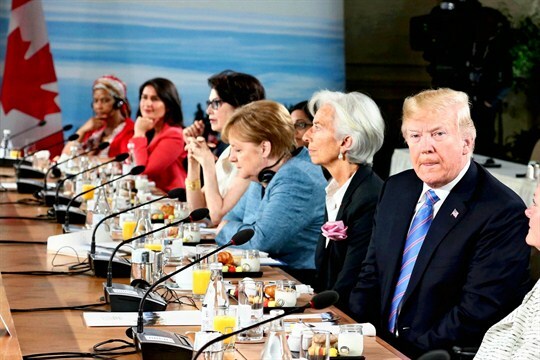 U.S. President Donald Trump attends the G-7 Gender Equality Advisory Council breakfast, Charlevoix, Quebec, Canada, June 9, 2018 (Yomiuri Shimbun photo via AP Images). In January 2017, as Donald Trump prepared to enter the White House, predictions of what his foreign policy might look like ran the gamut from a retreat into neo-isolationism to a reassertion of bare-knuckled power politics. As the incoming administration scrambled to name the team that would be responsible for translating the president-elect’s rhetoric into policy, I speculated about what might replace the liberal world order he had inveighed against during the campaign. Two years later, in light of his actual policies, the time is ripe to consider whether these scenarios were prescient or unfounded.